Our exclusive designs in Trilogy beaded curtains and chandeliers with triangle-shaped beads from ShopWildThings are adding contemporary glamour to special events around the country. They're lightweight, too, for easy installation and storage. We love them, and so will you. Our matte Trilogy triangle bead curtains are available in a sleek silver or soft gold matte finish. 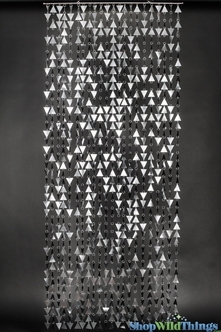 Thin PVC sheets are die-cut into triangles, which will catch the slightest breeze to cast a stunning play of light from reflections. Each easy-hang rod has 22 strings of 2-inch triangular beads. Watch our how-to video to discover how easy it is to hang each with two nails or two hooks. The curtain is 33 inches wide and 7 feet, 8 inches long. For retail inspiration, check out our photos showing the use of these beaded curtains in the window at a Quicksilver/Roxy store at a Downtown Disney complex. Passers-by could not resist stopping to admire the sparkling retail window display. Because the triangles are attached with jump rings, it's easy to shorten by removing rings or lengthen your curtain by adding beads from an extra curtain. Our Trilogy chandelier with dark matte silver triangles is an exquisite addition to any upscale wedding reception or gala. Use with or without one of our optional light cord kits. Or, simply add our LED light discs at the top. Click on our how-to videos for a demonstration of how to install light kits inside chandeliers. This triangle-bead chandelier has three circular tiers. The triangle beads are each 2 inches in size. The length is 21.25 inches, which extends to 24 inches with the included hanging chain. If you want more length, simply purchase one of our beaded triangle Trilogy curtains for use of the strands.